After sunset look eastwards. A low horizon is needed but not a volcano. 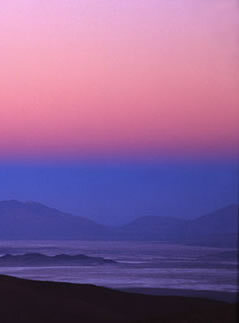 As twilight deepens a dark band rises upwards from the horizon, The band is the shadow of the Earth on the atmosphere. 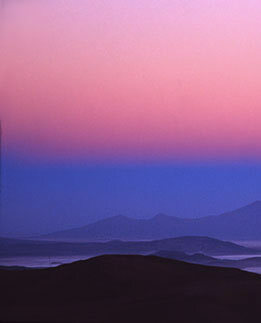 Immediately above, where the evening air is still lit, glows a pink band called the anti-twilight arch or "Belt of Venus". The pink arises from scattered and deeply reddened sunlight mingling with the deep blues of the eastern sky. Look westwards before sunrise to watch the shadow sinking towards the horizon. The Earth's Shadow. As the sun sinks deeper below the horizon, the Earth's shadow rises in the east. The shadow is a three dimensional void of unlit atmosphere. The sky high above the shadowed air is bright because it is still sunlit and the air scatters light down to the eye. This diagram is not to scale! The atmosphere is a thin skin compared to the diameter of the earth.